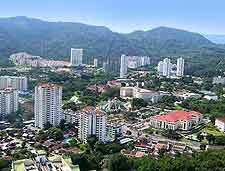 The island of Penang (Pulau Pinang) is a real tourist highlight in Malaysia and combines many different draw cards, with excellent beaches, a multi-cultural heritage, lush jungles and exceptional gastronomy. 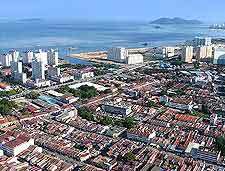 Penang lies next to the north-westerly coastline of Peninsular Malaysia and features an undeniable tourism scene, which is very much concentrated around the beach resorts of Batu Ferringhi, on the north coast, and within the World Heritage Site of Georgetown, the capital. Georgetown is a favoured destination for tourists, who come here to explore the colonial architecture, historic temples, extravagant mosques and undeniable Chinese culture. 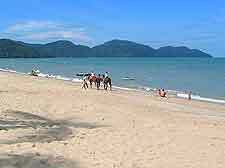 Other visitors will favour hiking through the northerly Penang National Park, shopping within the Gurney Plaza, or even parasailing high above the sandy beaches. For the latest in the way of tourist information, look out for the free magazine named 'In Penang', which is readily available around the island. Often referred to as the 'Pearl of the Orient' and one of Malaysia's most visited tourist destinations, Penang's coastline and beaches serve as a major draw card. Families will enjoy spending time at attractions such as the Butterfly Farm and the Bukit Panchor Recreational Forest, while others choose to base themselves within the resort known as Penang Hill. Fort Cornwallis is another popular sight, while the fragrances emanating from the plentiful oriental restaurants within the Chinatown district can prove rather tempting for many a holidaymaker. 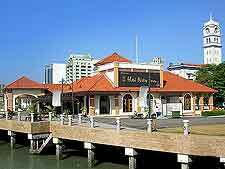 More information about Penang Tourist Attractions. 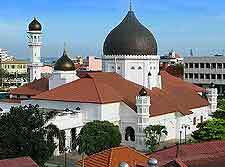 The rich heritage and culture of Penang is very much reflected within its beautiful buildings and landmarks. Particularly impressive are both the Kek Lok Si Temple and Kuan Yin Temple. A little different is the Snake Temple in the Bayan Lepas area, which is close to the airport and home to a number of friendly pit vipers, which live amidst the burning incense. The Chinese culture within Penang is ever present around the island and the Cheong Fatt Tze Mansion is a good example of this influence. Something more modern is the KOMTAR complex, which towers on the skyline and offers shopping, restaurants and theatres. More information about Penang Landmarks and Monuments. A diverse collection of museums are spread around the island, with the Penang Museum and Art Gallery being one of the better choices and packed with local information. The themed galleries within the Islamic Museum are also popular, as are the thousands of exhibits located within the Toy Museum. Malaysian artists regularly display their creation at a small selection of galleries, such as the Yahong Art Gallery next to the Batu Ferringhi beach, at the Art Gallery in Georgetown, and at the Universiti Sains Malaysia Museum and Gallery within the township of Minden Heights. More information about Penang Museums and Penang Art Galleries. Penang Island is well placed for tourists wishing to explore Malaysia and lends itself to many suitable day trips, which are often just a short boat trip away. The beaches of Pulau Langkawi (Langkawi Island) are always enticing, along with the scuba diving scene of the neighbouring Perhentian Islands, and the various attractions of Butterworth, a town located within the hinterland of Seberang Perai and best reached across the Penang Bridge. Even the attractions of southern Thailand are within reach, particularly those of Hat Yai in the Thai province of Songkhla. More information about Penang Attractions Nearby.